Glastonbury Festival was founded in 1970, long before people began to become concerned about climate change. Yet even then all the milk, the cider and the straw came from the farm. We were green then, and we are just as green now. These days, of course, everyone has woken up to the fact that we really have to do something about protecting the environment and reducing our impact on it. As a Festival we’ve been exploring new ideas of how to lessen our toll on the land for as long as I can remember. As a Festival we’ve always tried to take an ecologically thoughtful approach to the way we do things, which we always hoped would inspire people. My family have farmed this land for generations – having walked here with their cows from Dorset to set up at Park Farm in the 1860s. Looking after the fields, hedges and livestock has always been our number one concern. 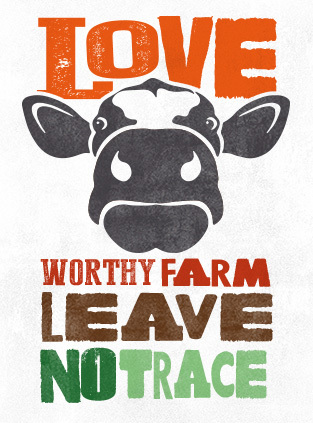 And today, our big campaign remains ‘Love Worthy Farm – Leave No Trace’. We are striving to leave as little an imprint on the land here as we possibly can. For me, Worthy Farm is what life here is all about. Glastonbury Festival has always been the first to host alternative solutions to environmental concerns, and over time we’ve watched as those alternatives have become mainstream. In fact, for me, one of the greatest benefits of Glastonbury Festival has been giving people the chance to open their eyes to something better, even if it is only for one weekend in the year. We hope that we can continue to lead the charge in sustainable living by making Glastonbury Festival as green as we are able to and by spreading the word to Festival-goers about what will really make a difference to the environment. We continue to work as hard as we can on the practical things: from encouraging people to travel by public transport to promoting some great new initiatives on waste reduction and pursuing more efficient ways of powering the Festival. Today, just as much as in 1970, we have to work hard on our message. Glastonbury Festival is a Midsummer celebration of life and joy, but we must not lose sight of our undertaking to achieve the best possible balance of nature and resources.